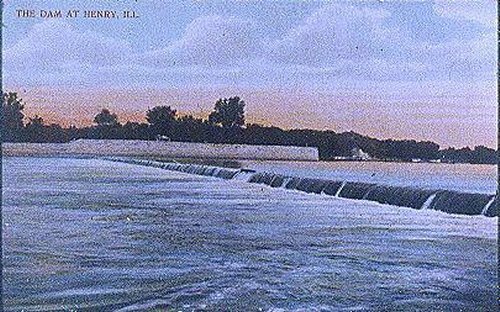 The first lock and dam on the Illinois River was constructed at Henry in 1870 at a cost of $400,000. Before the dam was built, the Illinois River was low enough to be forded near Henry. Farmers and industrial businesses depended greatly on the river for shipping. In order to make the river more navigable year round, locks and dams were built to control the water level. Photograph of dam seen from the east side of the river. Packet boats, such as the David Swain, had to go through the locks to get to the other side of the dam. Image of David Swain in locks. A lock tender was on duty most of the time, opening and closing the locks by manpower. The lock was last used in 1927. 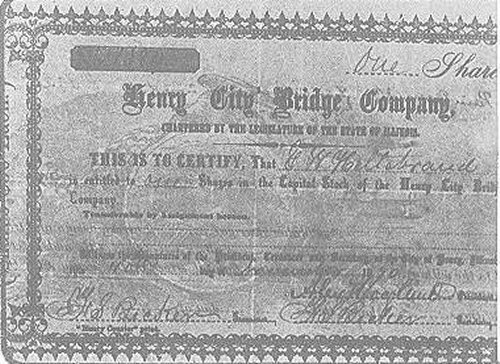 Local businessmen formed a stock company during the construction of the dam to raise money to build a bridge across the river down stream from the locks. Shares were sold at $50 a share. The city and township bought the major portion of the shares, as well as many private citizens, to raise the $80,000 needed to build the bridge. 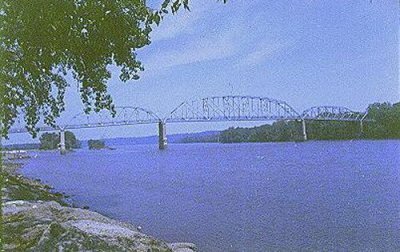 The new wooden swing-span bridge was opened in December of 1870 and was described at the dedication as the "best wagon bridge in the state." It was made of heavy timbers and had a central swing span to allow boats to pass through. Packet boats arrived daily in Henry for shopping, visiting, and attending dances and social events at the Pavilion Park. Business centered around the river front area. 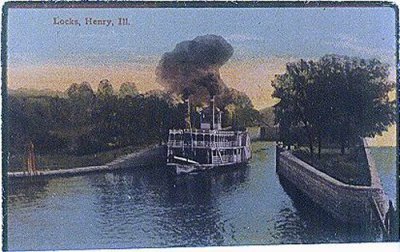 Henry was a bustling hub of activity for fishing, shipping of grain, and livestock. During the winter months, ice was shipped to Chicago restaurants. In the 1930's, a barge struck a pillar of the wood bridge, damaging it beyond repair. 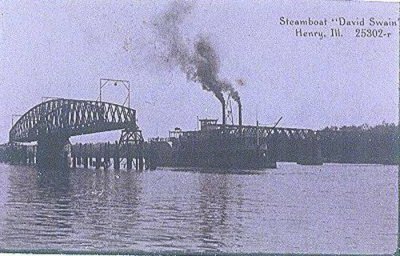 A ferry was used for a time until a new bridge could be built. Image of the David Swain in span. 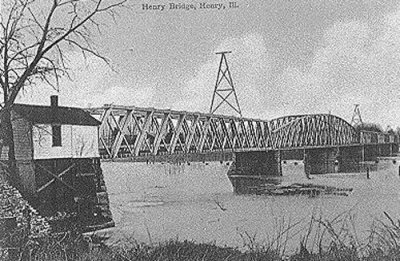 On August 15, 1935, a new steel bridge was dedicated, 100 years after the first settlers had arrived in Henry. The new bridge span is 1,717 feet long and cost about $500,000. It is a valuable link to the counties on the east side of the river and the communities and major highways on the west. 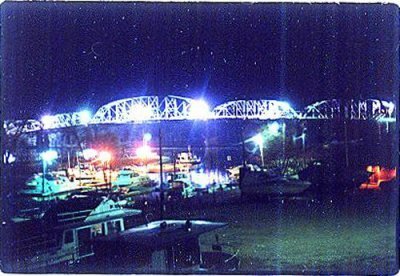 After many years of carrying traffic across the Illinois River, the bridge again was closed in 1988. 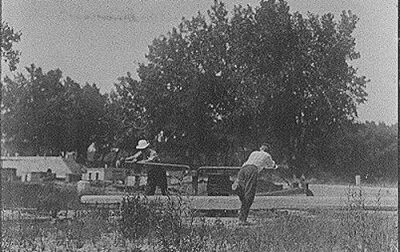 Construction crews worked night and day to repair the vital link between Putnam County on the east side of the river and the Henry community on the west. Traffic was rerouted to surrounding communities. School buses customized their routes to provide continued service to the students. The continual work into the night created a beautiful sight along the riverfront. 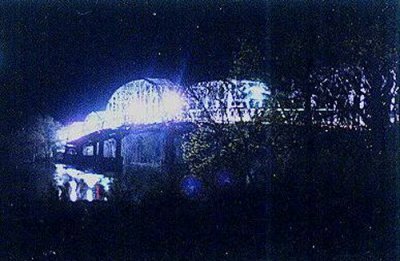 Image of bridge at night during construction. Once again, the river front community survived a setback to its economy but like other strong communities overcame the obstacles. Henry is still a beautiful, graceful river community, changing with the seasons, the economy and world issues, to provide leadership, security and strength for a hometown community.